Some websites and products have made bold claims that common genetic variants in MTHFR can cause a wide array of health conditions, ranging from blood clots and cancer to autism and migraines. So we decided to dig deeper into the published scientific literature to evaluate the evidence. Here’s what we know about MTHFR. The MTHFR gene contains instructions for making an enzyme that’s important for metabolizing folate (also called folic acid or vitamin B9). MTHFR also helps our cells recycle homocysteine, a chemical in the blood, into methionine, a building block for proteins. We also know that there are two common naturally occurring variants in the MTHFR gene, called C677T and A1298C. When the MTHFR gene has either of these two variants, the resulting MTHFR enzyme is slightly less active, and this can lead to decreased levels of folate and increased levels of homocysteine in the blood. Some websites have spread the idea that having one or two copies of an MTHFR variant can lead to dozens of negative health consequences. There are a couple problems with this claim. First, it’s unlikely that variants in a single gene could cause dozens of unrelated health problems. Second, the C677T and A1298C variants are very common: in some ethnicities, more than 50 percent of people have at least one copy of one of these variants. Most disease-causing genetic variants are not this common. * Another claim about MTHFR is that people who carry an MTHFR variant should avoid foods that are fortified with folic acid. However, there’s no evidence that individuals with an MTHFR variant should reduce their folic acid intake. Websites and blogs are filled with misinformation about MTHFR. When you’re looking for information about science and health, make sure you find trustworthy sources. • Understanding Health Research (http://www.understandinghealthresearch.org/), a tool to help evaluate the quality of health studies. 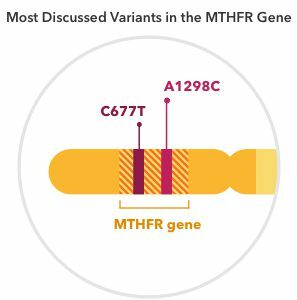 Over the past two decades, scientists have examined associations between the MTHFR C677T and A1298C variants and more than 600 medical conditions. Despite thousands of scientific publications, the evidence linking MTHFR to most of these health conditions is inconclusive or conflicting. For example, some studies report an increased risk of heart disease for individuals with two copies of the C677T variant, while other studies report no association with heart disease. The same is true for cancer, blood clots, and many other well studied health conditions. There is one exception: women with two copies of the C677T variant appear to have slightly increased risk of having a child with a neural tube defect like spina bifida. However, according to the National Institute of Child Health and Human Development, as well as other countries’ nationwide health programs, folic acid supplementation reduces the risk of neural tube defects in all pregnant women, including women with an MTHFR variant.